Marine Entertainment System with Wi-Fi & TouchScreen! 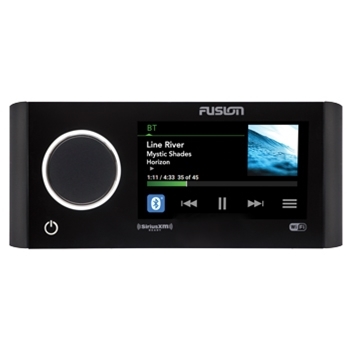 Fusions Apollo Stereo with built-in WiFi is a compact marine stereo with all the bells and whistles! 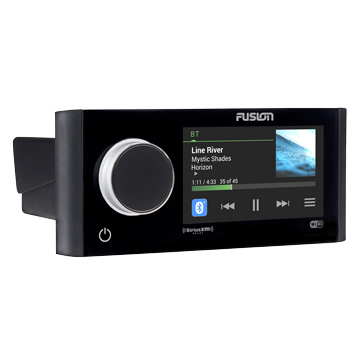 Enjoy the convenience of Fusion-Link Control through multiple connection options, Digital Signal Processing (DSP), and Fusion PartyBus just to name a few. Featuring a 4.3” optically bonded touchscreen display, simply tap the screen to control your sound experience. Swiping through playlists has never been easier. The Apollo RA770 features a 280W peak power output and an internal Class-D amplifier. With the ability to support 4 zones, the Apollo is scalable to your boat. Four zones not quite enough? 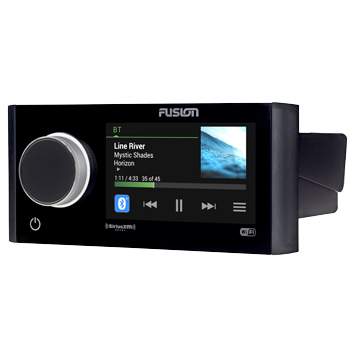 Fusion-PartyBus allows for pairing with additional PartyBus enabled stereos. Join Party Mode and play the same song synched to perfection on all stereos or control each radio separately when in Personal Mode. You can even control one stereo separately and the remaining stereos together. The options are endless! How is the sound quality? WiFi audio streaming delivers higher quality audio in comparison to a Bluetooth connection due to the faster data transfer. Not only does the WiFi provide better performance; it also allows for over the air software updates when synched with the free Fusion-Link App. The Fusion Link App allows for control of your Apollo from anywhere on the boat. Multiple control options include NMEA 2000, Ethernet when paired with a compatible MFD, Wi-Fi, NRX remote, Bluetooth via a compatible smart device, or ANT with the Fusion-Link Lite App on a compatible Garmin watch. Creating an enjoyable environment on your boat has never been easier or more intuitive with Fusion-Link control. Fusion 6 meter extension cable for connecting WR600 wired remotes to a 600 series stereo.